Lyon Eats: Chili and chili cheese dip... made in France! It's a good Monday morning when you wake up and find two recipes (with photos!) waiting in your email inbox. Lyon Eats reader and contributor D. is sharing her Tex-Mex discoveries with us. Thank you! I've been on my own little Tex-Mex mission, specifically to find chili powder or a good substitute for it. I've found some great stuff that makes chili you can barely tell wasn't made with the chili powder that I brought from home. Below is a copy of quick chili recipe you can make with ingredients bought right here in Lyon, and a chili cheese dip you can make with the leftovers. 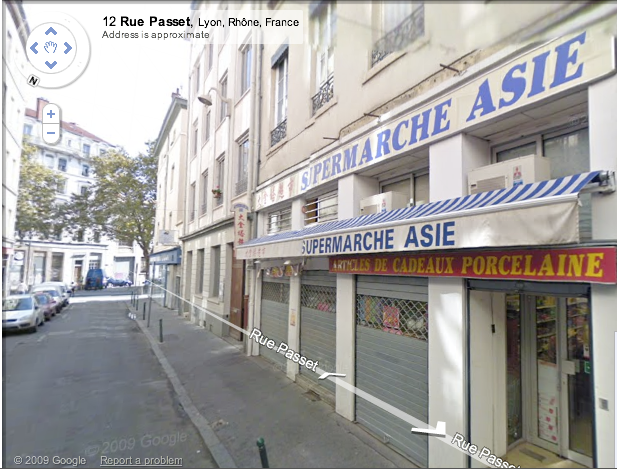 For the spices you will want to go to Supermarché Asie at 12 rue Passet, 69007, Lyon. Enter the store, go straight, past the rice, then right away to your right there will be an aisle of spices in little plastic bags. Most are of the Espig brand. Get one 100g bag of Epices Loubia and one 100g bag of Piment doux especial. This piment doux is not the same as you might already have in you spice rack that you got at Super U or wherever. Both cost between 1,30E and 1,80E. Epices Loubia is a spice mix used to make a North African bean-based dish. I've had it at my mother in law's house, and I kept saying to my self, darn, that tastes a lot like chili. You'll notice that in the picture with the three bags of spices I tried out the chili powder that I brought from home in the background is of a darker and richer in color and flavor. WARNING: There is something called "chili powder" for Tex-Mex recipes right next to the ingredients you need to get. Trust me, it's not chili powder, it's more like cut cayenne pepper with a strong hint of clove!!! Open cans of tomato paste. Open the can of bean, and drain. Heat oiled frying pan to med-high to high heat. Salt and brown ground beef. Add Loubia spices and Piment doux especial, stir and let cook with the meat for about 30 secconds. Add 2 1/2 cups water, 2 cans double concentré de tomate, drained beans, and sitr until well mixed. Let simmer until desired consistency, about 2-4 mins on high heat. Add 1 Tbsp garlic powder and 1 tsp oregano in the last minute of cooking. Set aside a bowl's worth of chili. In a larger bowl mix about equal amounts of chili to St Moret cheese (which is just like our cream cheese). Heat until melted in the microwave and stir. Eat dip with tortilla chips! Thank you, D.! These recipes look great. I stumbled across your blog today reading comments at another site. And I really like your site. I've created a site that helps people get their travel blogs / travelogues/ Travel Resource sites noticed by other travel fans. You can find out more about it at http://travelblogreviews.com/about-us There's no cost or obligation, I just like spreading the word.